EVERWHERE YOU TURN, SOMEONE OR SOMETHING IS TRYING TO STOP YOU. TO KILL YOU. IT EASY) TO START PLAY. OR USE BLACKFIST'S EXCELLENT WADRUNNER PROGRAM. THROUGH A POSTAGE STAMP SIZED WINDOW, EASY MIGHT HELP IMPROVE THE FRAME RATE. TESTED. DEATHMATCH START POINTS ARE IN RELATIVILY "QUIET" AREAS. 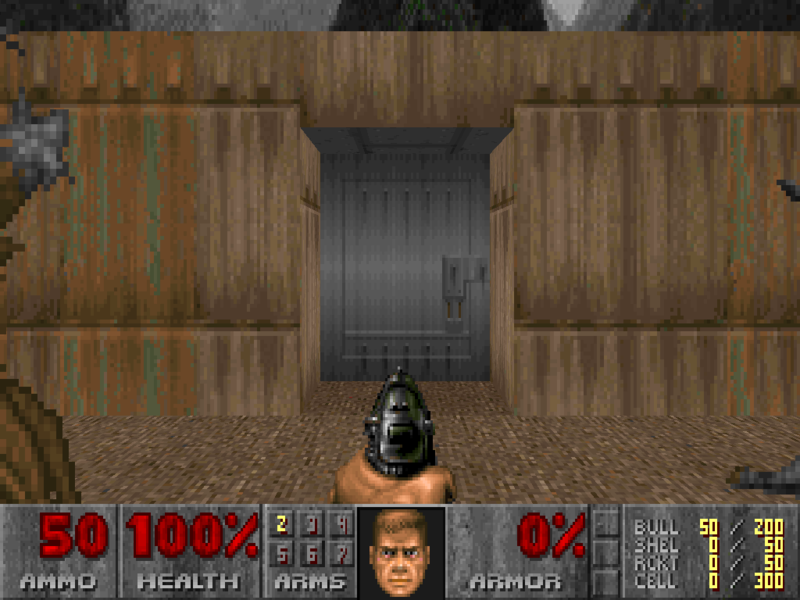 DOOM "PORTAL" WILL NOT WORK WITH NON-REGISTERED VERSIONS OF DOOM. SUPPLY MANAGEMENT IS VERY IMPORTANT IN DOOM "PORTAL." A 50 ROUND BOX OF BULLETS - YOUR LOSING 35 ROUNDS YOU'LL WISH YOU HAD LATER. IF YOUR FISTS WILL DO THE JOB. CONTINUING, BE SURE TO SCROUNGE UP EVERY LAST BIT OF AMMO, ARMOR, ETC. BE SURE YOUR GAS TANK IS FULL AND YOUR KNUCKLES ARE PRIMED. TESTING OF THE LEVEL MUCH MORE "INTERESTING." DO BETTER THAN THIS OLD MAN. "PITS" THERE SEEM TO BE NO SAVEGAME PROBLEMS. DESIGNERS WERE SO GOOD AT WHAT THEY DO! NEW LEVEL POSSIBLE. I LOOK FORWARD TO DEU v5.1! THANKS TO COLIN REED FOR HIS BSP UTILITY WHICH MAKES DEU WORK. COMMENTS AND SUGGESTIONS. I REALLY APPRECIATE THE HELP!